What do you do with all those little balls of yarn left over from every single pair of socks you make? 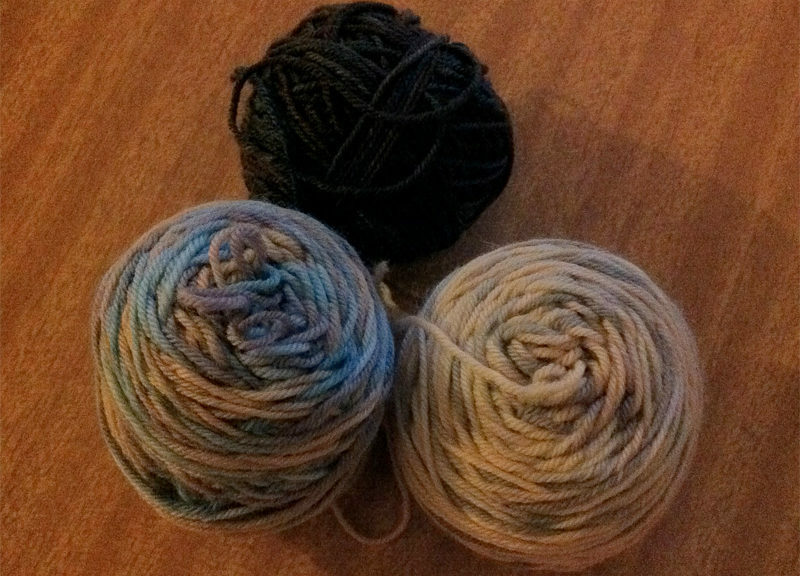 It has always been a waste to me these small amounts of left over yarn from knitting luxury hand made socks. After a little think and successfully making the Linen Stitch scarf out of lots of left over sock yarn I decided to make a sock. 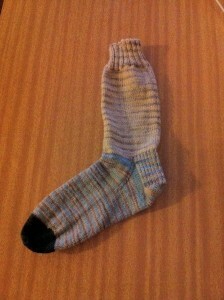 So here is my sock made with three colours of Lorna’s Lace Sock Yarn. The three pairs of socks were knitted by my friend Alice and while the two lighter colours are mine the rich brown/blue is left over from a pair for Alan. I knitted this using Hiya Hiya DPN size #1 as I did find mine by Alice done on a #2 were a little loose. I used three little balls – and have three more to do the second sock. And the pattern I used was Ann Norling #12 which for a plain all round good fit sock takes some beating. Not sure is I shall just wear these with some boots during the winter months or they might end up being bed socks for this winter. Who would have thought that one could have a love affair with some double pointed needles at my age! Someone I knit with at the lace guild had been using the Hiya Hiya circular needles to make lace. They had mentioned how smooth the joins were and how sharp the points were on the smaller size needles. More importantly was the fact they were made of stainless steel and left no residue or colour on their pure white yarn. This was exciting because they had previously been using the Addi Turbo Lace needles and their white tablecloth was black in parts from the needles. As I have plenty of circular needles in all brands, shapes and sizes I could not justify the expense of just another brand of circular needles to try. But as the saying goes there is more than one way to skin a cat! I found a local yarn store that sold Hiya Hiya needles and decided to purchase double pointed needles as I have started being able to knit socks again. I had a very bad fall several months ago and found it very difficult to knit with any needles smaller than a size US6 comfortably. When I got to the store they had size US1 and US2 and so I bought a pair of each. When I started a pair of socks for my Dad, what I found immediately was that the 6 inch length was absolutely perfect. I have previously struggled with the 7 and 9 inch ones – far too much needle, and then the 4 inch ones stick in the palm of my hand and are very uncomfortable. Now that maybe my style of knitting, however my knitting friend on Sundays went back to using the long needles as the 4 inch ones hurt her hands too. Since buying the first two pair I have gone back and purchased US3 and US4 both of which I can use for the sleeves on an Alice Starmore sweater I am currently knitting. My father recently sent me a knitting pattern for some cable socks, is that a hint or what, and that pattern suggests both the US1 and US2 so the smallest size will also get used fairly soon too. As for the socks I originally started with the Hiya Hiya needles for Dad? They will be on their way to Australia this week. And since then I have made a pair for Alan and have almost completed the first pair for myself.